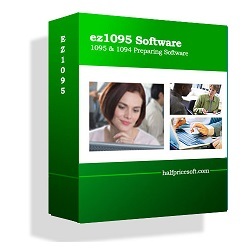 Houston, TX (1888PressRelease) January 25, 2016 - Employers and tax professionals that need to file 1095 forms in Year 2016 should try out the new ez1095 software from halfpricesoft.com. ez1095 can print form 1095C, 1094C, 1095B and 1094B. It has also heen approved by IRS to generate the efile documents that customers can upload to IRS for ACA form electronical filing. ez1095 software allows customers to import data quickly from external file and makes it easy to print ACA forms for recipients. Priced from just $195 per installation, ez1095 can support multiple company accouns on the same machine with no extra charge. "The new efile version of ez1095 2015 software for printing ACA forms 1095 and 1094 has just been released by Halfpricesoft.com." said Dr. Ge, the founder of Halfpricesoft.com.